Bird Id - Forum - Identifying Birds - Is This A Chukar? Forum > Identifying Birds > Is This A Chukar? 2 Had a pair of these have a quick walk round the field at the back of my garden and only had a chance for a quick snap. I'm thinking a Chukar or a Rock Partridge, any ideas? 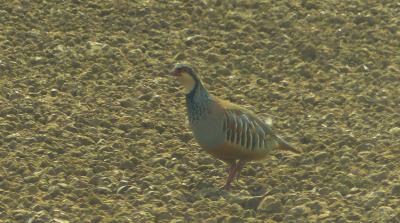 160 "After looking around more I think it might be a Red Legged Partridge"